Battleborn now has a Free Trial, what does that mean? The Battleborn Free Trial is a whole new way to experience Battleborn without having to pay a dime. The Free Trial encompasses UNLIMITED Competitive Multiplayer play, including access to all four competitive multiplayer modes, a rotating roster of free playable heroes, and the same character and account growth and progression you would find in the full game. Yes, with the Free Trial, you can play UNLIMITED Competitive Multiplayer matches, no time limits or artificial level caps. Everyone who downloads the Free Trial will have access to all four competitive modes: Incursion, Meltdown, Capture, and Face-Off, with a fifth mode, Supercharge, arriving on Thursday, June 22, 2017. Each Free Trial player will also have access to a subset of Battleborn’s 30 unique heroes through a rotating roster of six heroes that changes weekly. Love a hero and want to keep playing after the roster changes? No problem! Unlock your favorite hero from the in-game Marketplace using Credits earned while playing matches. Or with Platinum premium currency, unlock your favorite heroes and customize them with a myriad of skins and taunts. 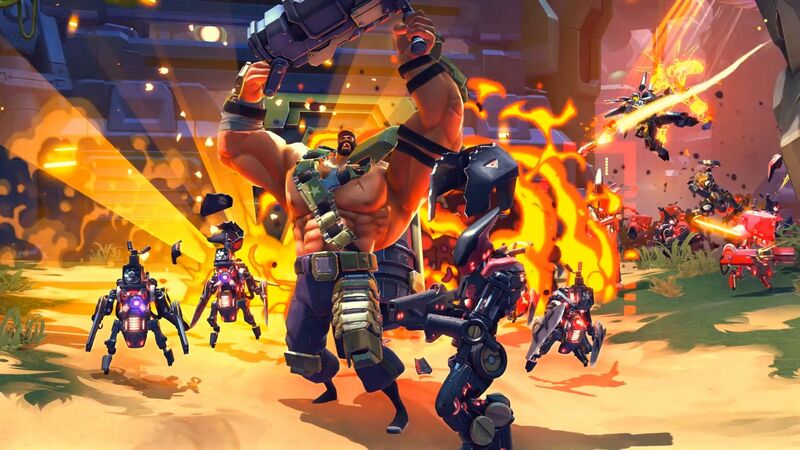 The Battleborn Free Trial is available on PlayStation 4, Xbox one, and Steam. Search for Battleborn in the PlayStation, Xbox, or Steam stores and head to the store page. Each page will have a “Try Now” button to download the Free Trial. Enjoying the Free Trial and want more? We love that you’re enjoying Battleborn’s Competitive Multiplayer! If you’re interested in unlocking more heroes, further customizing your favorite hero, or even playing the Story Mode missions, there’s a whole Marketplace to choose from. Keep reading to see how you can upgrade your Battleborn experience. What does it mean to upgrade Battleborn? Upgrading Battleborn means getting access to the full base game, including unlocking all 25 base characters, all eight Story Mode missions and the Prologue, and permanent access to private matches. PlayStation 4, Xbox One, and Steam achievements or trophies will also be granted upon upgrading to the full game. In order to complete the transfer of challenges, masteries, achievements, and trophies, complete the task one more time by hopping into a match or mission to complete the action (ex. get a kill, play as a Peacekeeper) and earn the corresponding reward. To upgrade digitally, the full game can be found in the PlayStation, Xbox, and Steam digital storefronts. If you want to hoof it to get a physical disc, there’s a chance you can snag the base game for a nice discount at your favorite retailer. Great question! If you upgrade to the full game or purchase the Season Pass bundle, AND you already own some of the content in the bundle, you will be credited the value of that content in Credits, the currency earned in-game. For example, if you already own three Battleborn heroes (let’s say Thorn, Boldur, and Alani), and want to upgrade to the full base game, you will be granted earned Credits for the heroes that are part of the base game (Thorn and Boldur). Alani is a DLC hero (heroes 26 through 30) and was part of the Season Pass, not the base game. As such, her Credits value would not be included when upgrading to the base game. Not a problem! There are many a la carte options to suit how you want to play. Check out the in-game Marketplace to get as many extras or as few as you want. From boosters that will increase your XP gain for a day, to the full package of Season Pass content complete with five Story Operations and heroes 26 through 30. The choice is yours. There have been TONS of updates, additions, and changes to Battleborn since launch – Over 1,600 changes, in fact! Keep going to see what the big changes are for new players. Novice Queue – With the launch of the Free Trial, we’re also introducing a queue specifically for new players. This queue was created just so new and lower rank players can learn the ropes without having to go up against more experienced players. Even if you’re a quick learner or an experienced MOBA player, we wanted to give you enough time to find your Battleborn play style and favorite heroes. Matchmaking is an ever evolving process that we’re continually working on. As more players join Battleborn, we will keep refining this process using players’ Elo ranking to make it the best experience possible. Free Hero Rotation – Each week six of Battleborn’s 30 unique heroes will be available for everyone to play. This weekly rotation will give you the opportunity to play all of Battleborn’s heroes and find your favorites. If you love a hero and don’t want to wait for them to be back in the rotation, you can permanently unlock that hero from the in-game Marketplace. The goal of the Free Trial is to open Battleborn Competitive Multiplayer up for everyone in the world and grow the player base. We hope this endeavor leads to tons of new players for you to play with and against in PVP. More so, it has been a joy and a privilege to interact with the Battleborn community over the past year, and we want to show you how much you mean to us. We consider you our Founders and we’ve created something special just for you. Everyone who purchased and played the retail version of Battleborn prior to the release of the Free Trial on June 6th, 2017, has been granted a Founder’s Bonus. When you log into Battleborn, the Founder’s Bonus will already be granted to your account. Head to your Command center to open the new loot packs, equip your title, and spend that sweet Platinum. Everyone who owned and played Battleborn prior to June 6th, 2017 should be granted the Founder’s Bonus. To confirm you received the Founder’s Bonus, head to the Command center. On the top left-hand of your screen, you should see an additional 1,000 Platinum and 50,000 Credits by your account name.